I hope you don’t mind yet another picture in what’s now a three-week series revolving around flowers. I promise this wasn’t planned, and yet I like how things have turned out with these pictures. This picture most certainly was not planned, and it has not been altered in Photoshop (though I did perform my usual basic Lightroom adjustments like white/dark levels, clarity, etc.) but I’m super happy with how it turned out. I was literally just walking from the car to my building at work when I happened to pass in front of Murray Hall on the OSU campus. 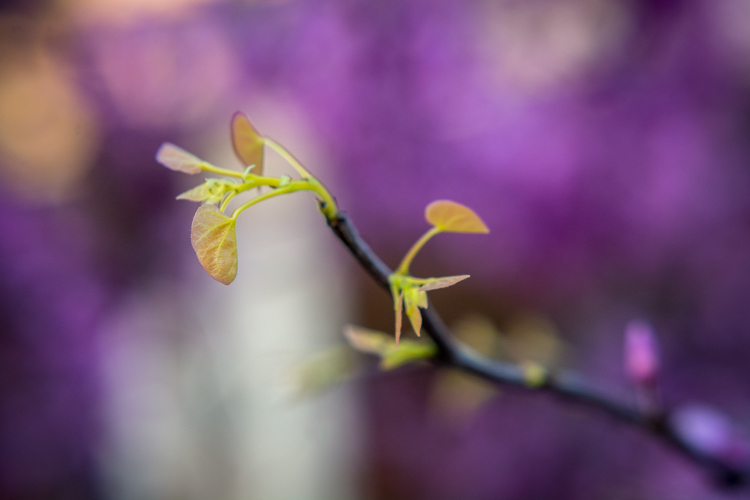 I saw a tree filled with purple leaves that was also sprouting some new buds which were, strangely, the opposite color. Click to see the larger version. If you look super closely you can almost see the tiny yellow leaves poking out all over. Since I had my camera with me, as I often do, I paused for a little bit to see if I could get a photo. I’ve tried taking a picture of trees like this one before but they usually ended up kind of messy and incoherent because it’s hard to make out a clear subject or focal point if you just have a bunch of purple leaves. All you get is a sea of color with nothing interesting, even though it might seem like a good photo opportunity at first. Well, that’s been my experience anyway. This time was different though, all thanks to (what else?) my close-up filters. Whee! 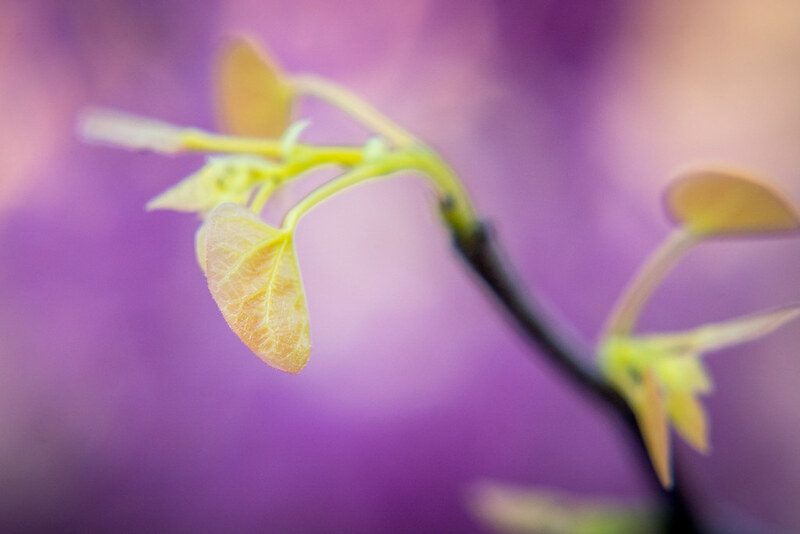 I started by using my +4 filter and focusing on a small yellow leaf, but the result wasn’t quite what I was hoping for. In this image you can clearly see the leaf but there’s too much else going on to distract you. There’s a sea of purple behind the leaf and with the other ones poking out below and to its right, it’s easy to get distracted and lose a sense of clarity. That’s when I decided to bust out the Big Guns and switched to my +10 filter, while also stopping down to f/8 to get a usable depth of field, which resulted in the photo you see at the top of the post. Perhaps it’s a bit overexposed, which I guess I could fix in Lightroom, and I do wish the white splotches in the background weren’t quite as prominent as they are, but nonetheless I really like the final result and it was fun to see all the elements of this shot come together in the way they did. One of the keys was the early morning light which added a nice soft glow to the scene which would not be present at all during midday, and I think it’s kind of cool to see two completely contrasting colors so closely linked like this. I’d like to revisit the tree soon and see how it has changed, and maybe even take another photo or two to document things. That’s a Redbud tree. The purple flowers spring out of the branches, not where you would expect them. Keep an eye on the new leaves. They will take on a beautiful iridescence that is fun to photograph. I noticed this evening that mine is showing the iridescence. This is from a couple years ago. Wonderful thought process and explanation of the composition. Given the circumstances of spur of the moment photogeaphy, w/o a tripod (I think) and a 10x close filter, the image is blurry and out of focus. It does achieve your objective of an educator . Therefore, I always enjoy reading your posts. Thanks for the explanation and the picture. 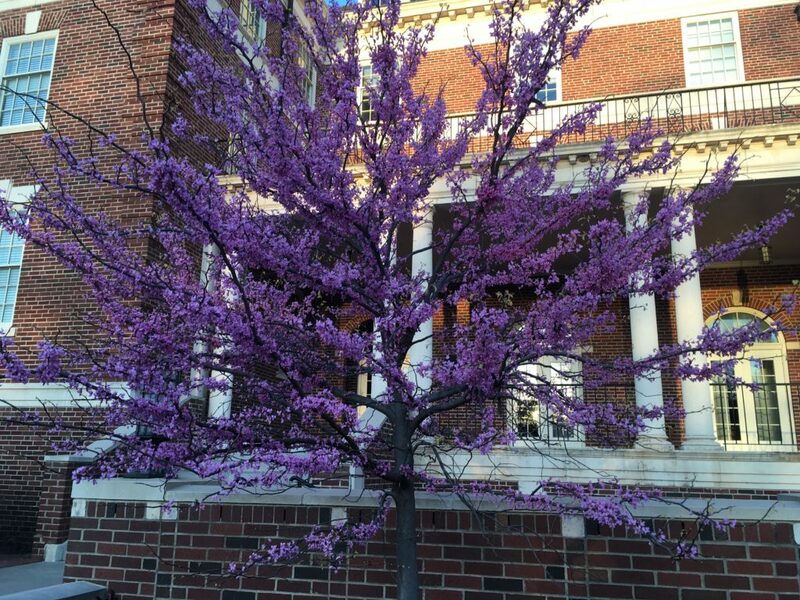 We have redbud trees on our campus also, but the new leaves come out red and then turn a dark green color as they mature. I have thought for the last few years of bringing my camera up and taking a picture of the new growth juxtaposed against the more mature leaves, and since the leaves are heart shaped, I thought it would make a nice photo to hang on the wall. Your picture just might get me motivated enough to do that.